Thanks, Phil and Stezza. Until now, I had been loading the figures directly in Carrara, editing the mesh in Carrara, and saving the changed figure. But that caused problems with autofit (but not with VWD - I love VWD) and the save process took a lot of time and space. This mehtod is much more efficient for conforming clothes. I have been playing with the plant editor's expert tab recently. Thought I would share some of my experience with two very different trees. 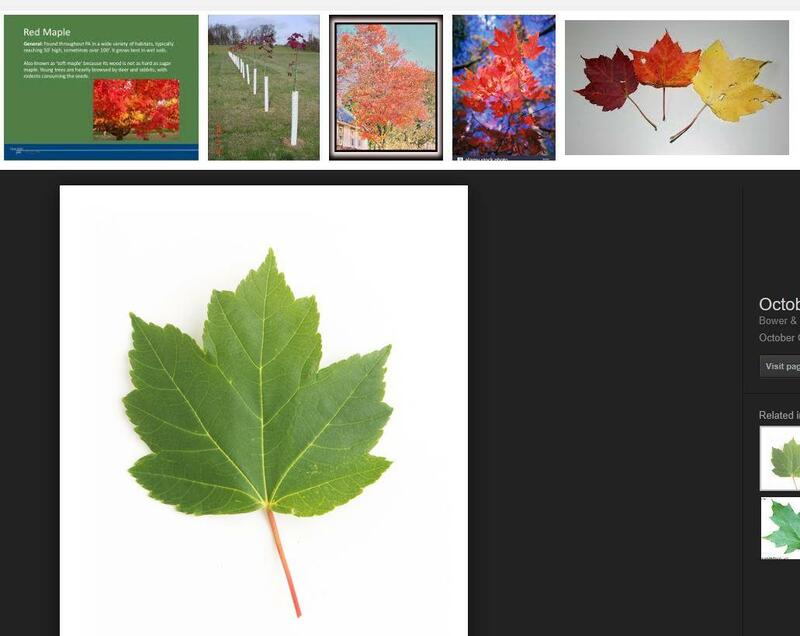 I will start with an example of the majestic trees of eastern North America, the red maple. Later, I will give an example of a broad tree of a savannah, the acacia. 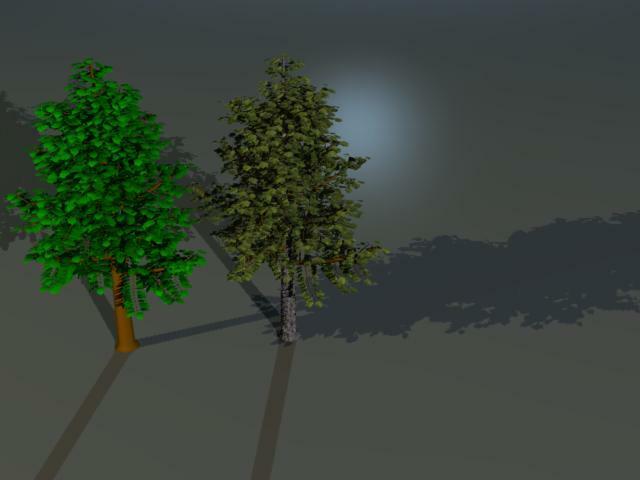 These two are chosen to show how the tree editor can be shown to customize a very tall tree of a dense forest and a shorter broader tree on the plains. The native content comes with a maple in the objects tab so in some ways this example is superfluous. However, it is just an exercise for me to learn. The expert tab allows for customization. First, I did some basic background research. There is plenty of information about tree characteristics available for free on the web. 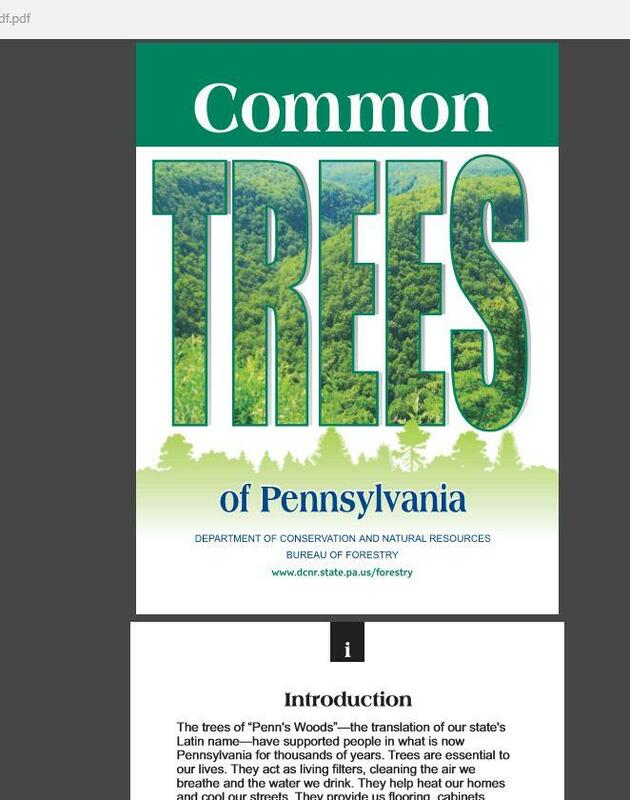 A free guide from the Pennsylvania state department of agriculture and forestry was extremely helpful. For this project, I chose the red maple. Red maples are abundant in natural woodlands in eastern North America. 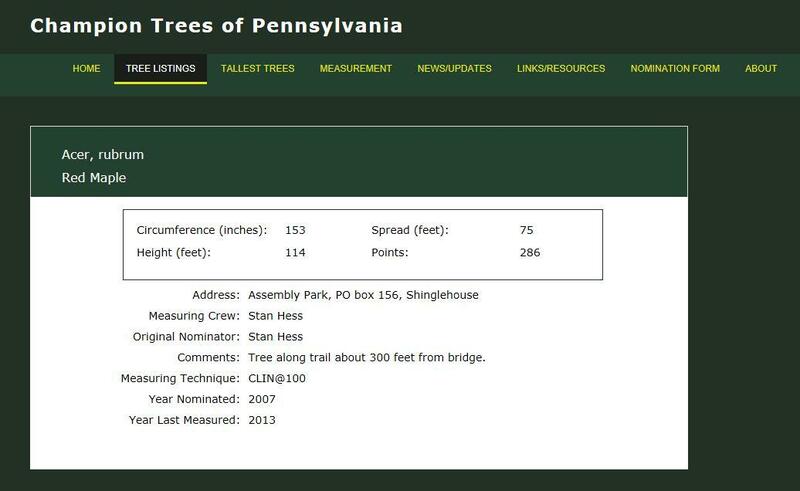 They are the most common big tree in many parts of Pennsylvania, typically reaching 80-100 feet tall. The spread is often about 20% less than the height, or even narrower where trees compete. When grown as an ornamental tree, the sread may be wider and height less, commonly 40-60 feet tall with a spread of 40 feet. The overall shape of the tree without competition is a dome shape. 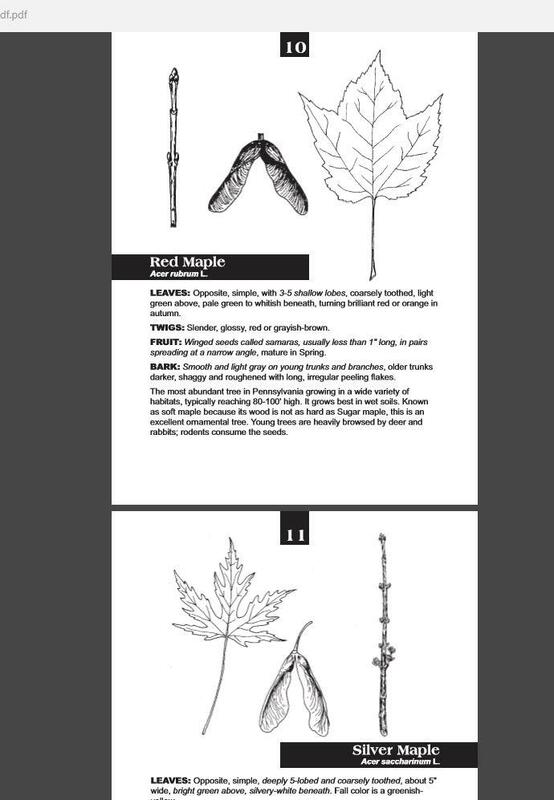 I also included examples of pictures of its leaves and its bark. Here are two of the reference images from the web. I will be going to our arboretum next week to get my own reference pics for textures, but these will do for now. Comparing red maple to acacia. In contrast, an acacia tree on a savannah will tend to be shorter and broader than a red maple in a dense woodland. The acacia tree often has thorns (and vicious ants) to protect itself from herbivores, and its leaves are more needle-like. 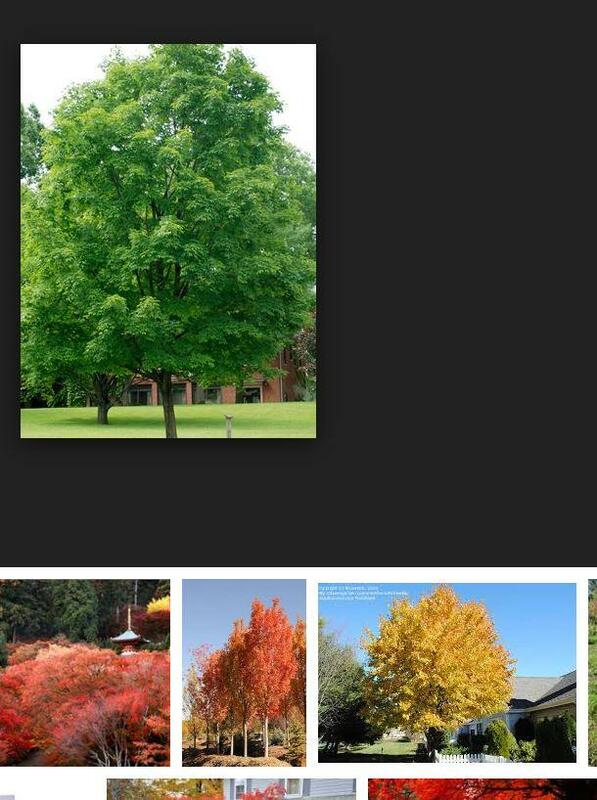 Here are some examples to contrast with the red maple above. 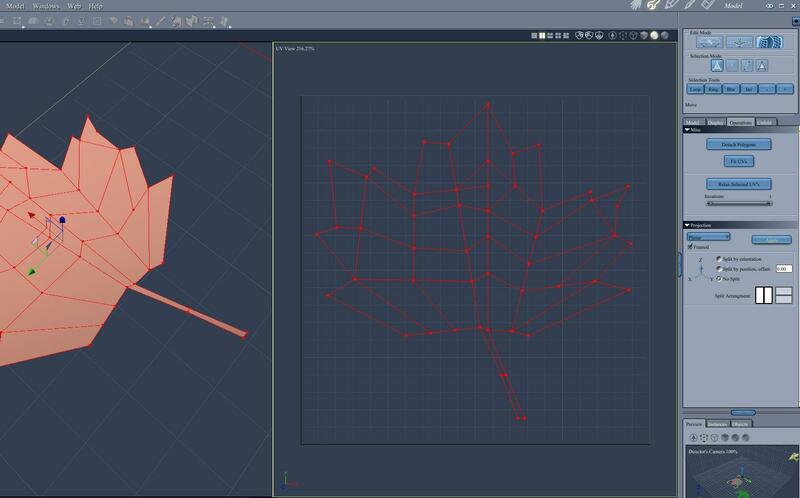 Reverse engineering the maple leaf that comes with Carrara's native content objects file. Ultimately, the workflow requires making a custom plant shape and a custom leaf shape, and perhaps seeds and twigs. To understand custom leaves, I started a new small sized empty Carrara scene. I dragged the maple leaf from the objects tab to the scene. I repeated for the maple leaf and bunch object. First, I noticed that the leaves loaded on the floor, but that their length extended along the X-axis, not the Y. Also, the hot points are in a strange place. I selected the maple leaf and entered the modeling room. 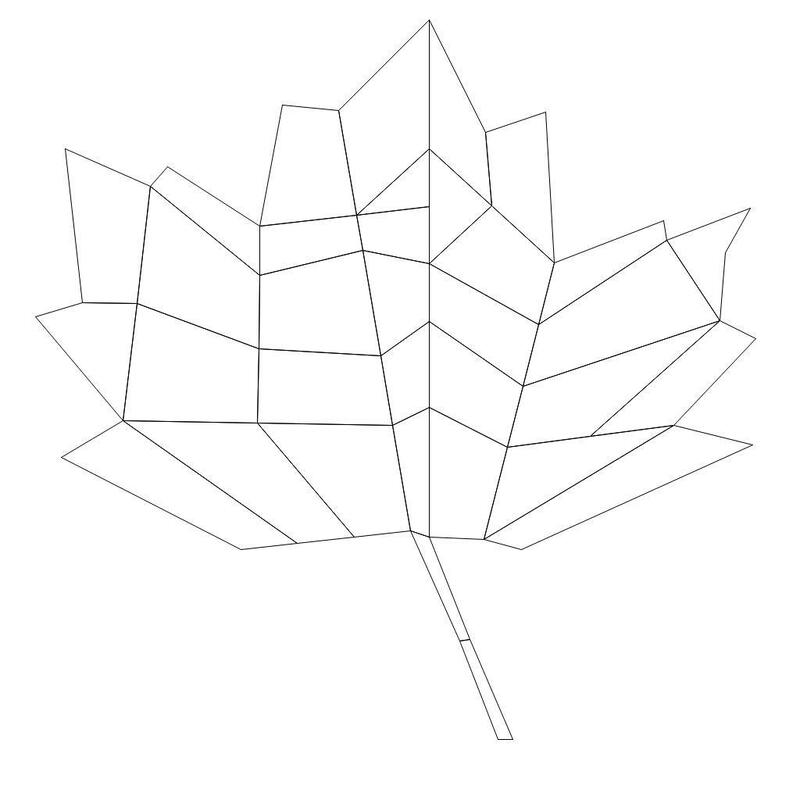 The leaf is flat two dimensional with only 1 shading domain. It has been bent so that it is not perfectly flat. I repeated for the leaf and bunch. It has many shading domains. It also has the 3D round berries. I deleted the leaves from the objects browser. I inserted a new vertex object. I loaded one of the reference images using the global tab. I loaded the reference in the top/bottom camera. I then used the camera men to view from the top. I used the polyline tool to trace the general shape of the stem and leaf. I kept it low poly. I then selected all and used FILL POLYGON. I then connected vertexes to converted to quads. Back in the assemble room, I used modeling in the assemble room to select the entire mesh and rotate so that it lay flat on the floor and extended along the X axis. Don't know if necessary, but I moved the mesh so that the base of the stem was near 0 0 0. Similarly, the hot point is at 0 0 0. I then selected parts of the leaf and pushed in and out so that it was not perfectly flat (so that it would appear in all camera angles). 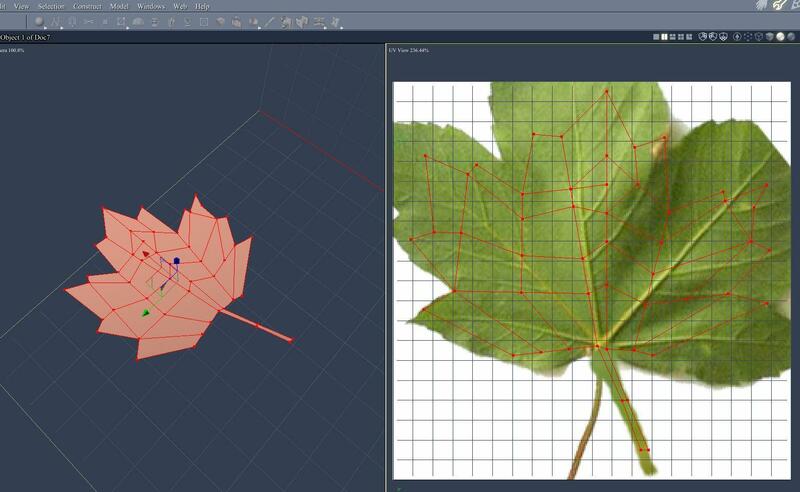 Note - we will see later that this leaf has too many polygons. Just learning for now. Ultimately, this will be done with my own pics. For demonstraiton purposes, I will use a pic from the web. First, under the operations tab, I entered the uvmapping area and created a simple planar uvmap. Note - this will not be my final uvmap. It is just the start until I get the reference image the way I want it. Next, under the display tab, I exported the uv template at a desired resolution, higher for foreground (hero) trees, lower for filler trees. I loaded the template in my image editor and did an approximat fit of a reference pic. I didn't worry too much about the details because I will be adjusting the uvmap again in Carrara. I exported the result from my image editor. Back in Carrara, I loaded the new texture template as the leaf's shader. I then retuned to the modeling room and entered the uvmap area. 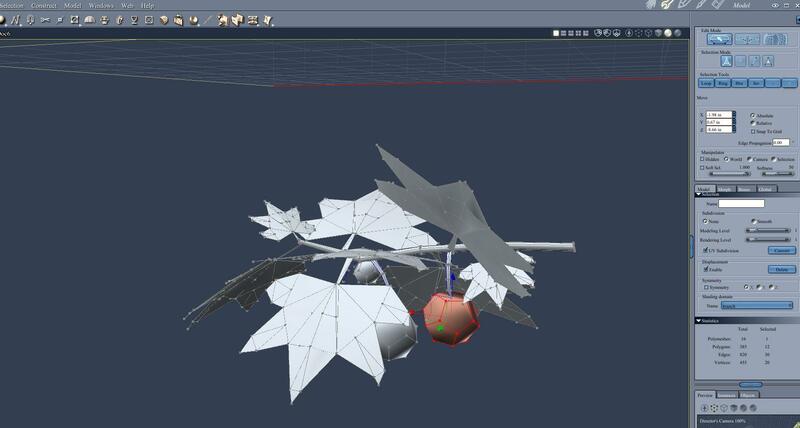 I then adjusted the uvs so that the veins of the leaf ended at the long pointy parts of the model. Here is a test render. I saved this leaf as a test leaf as I develop the tree. The leaf is not quite finished. Ideally, the shader would be adjusted for the bump map, translucency, etc. I am going to postpone that discussion for now. This leaf is good enough to finish the plant modeler demonstration. 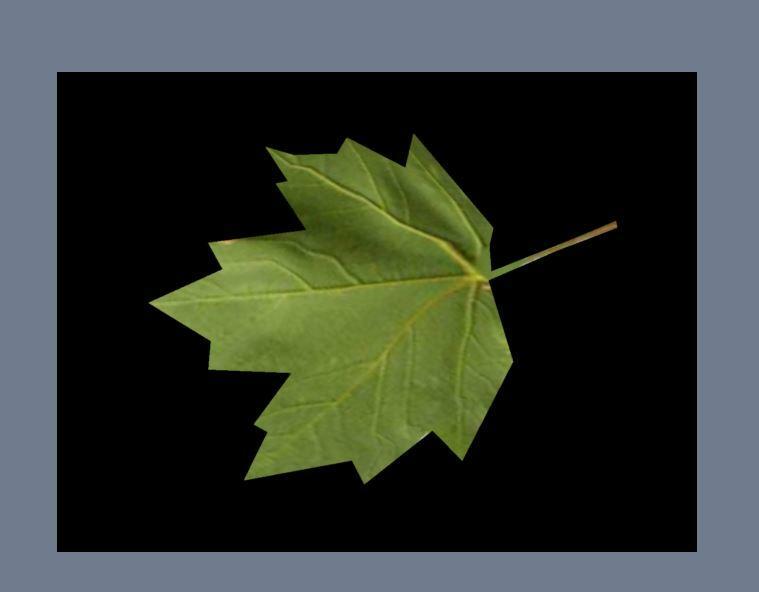 NOTE - leaves can also be obtained by using a square with a transparency map applied in the alpha channel of the shader. I started a new medium scene. I inserted two default plants and set them side by side for comparison. I selected one and entered the modeling room. The plant editor appeared. I used the leaf tab to remove the default leaves. 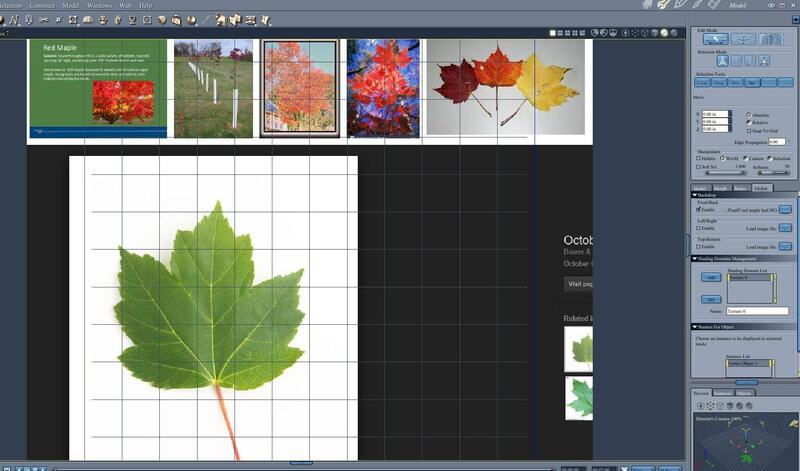 I used the LOAD tab to navigate to my saved custom leaf and load t on the tree. Back in the assemble room, I did a test render to compare the default leaves with my custom leaves. I did a second test render with closer focus on the leaves. Note that you can make 3 or 4 versions of the custom leaf and load them all for some variety. To see what is going on with the leaf shader, I selected the plant and entered the shader room. If you look on the right, there are shader domains for the global (of course), and then broken down to trunk, branch 1, branch 2, and leaf. If you look at the shader tree, you can see that the default global shader is a layer list. The layers correspond to the shading domains. So, in the absence of applying a custom shader to a domain, the layer list applies. 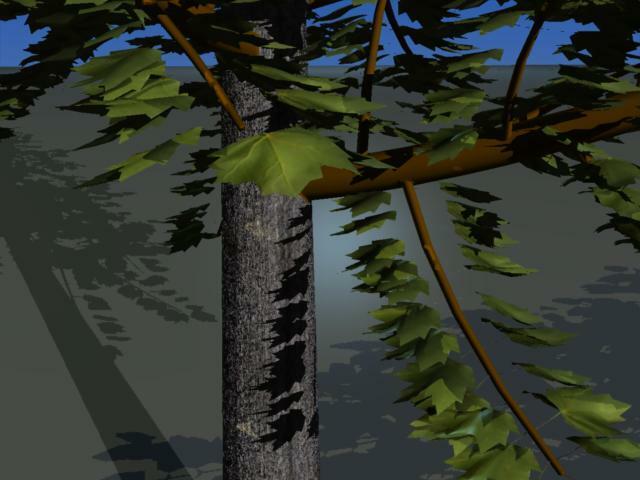 The layer list applies parametric mapping to the trunk and branches. 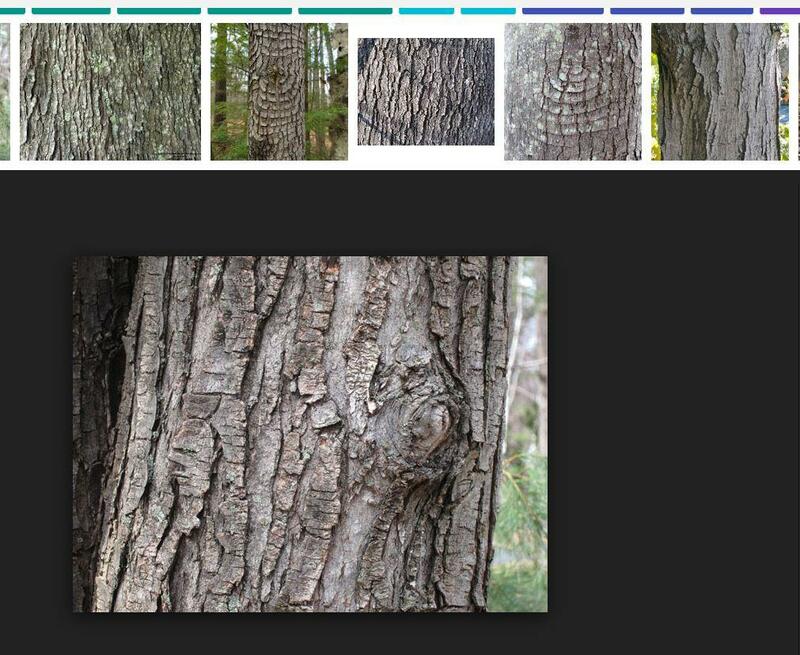 For this demonstration, I applied a reference pic of tree bark to the trunk, but not the branches. 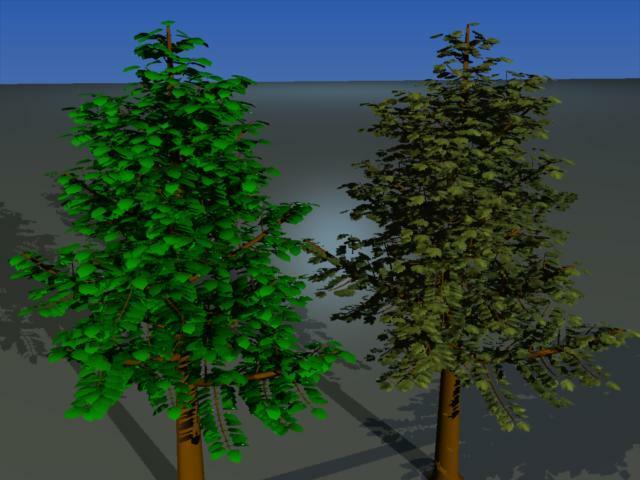 I did another test render to compare the custom tree to the default tree. And here is a test render closer to the trunk. I think the trunk looks a lot better than the branches. I plan to take my own pics at the arboretum this week. The plant editor allows for quite a bit of customization. 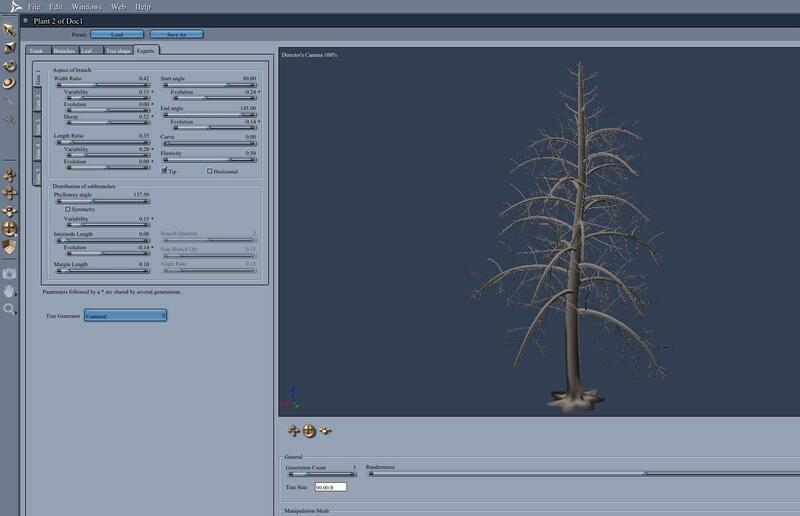 It is important to start with the menu for Tree Generator under the experts tab before doing other edits to the tree size and shape. The reason is that changes to the generator menu will reset other options, which you probably don't want to lose. 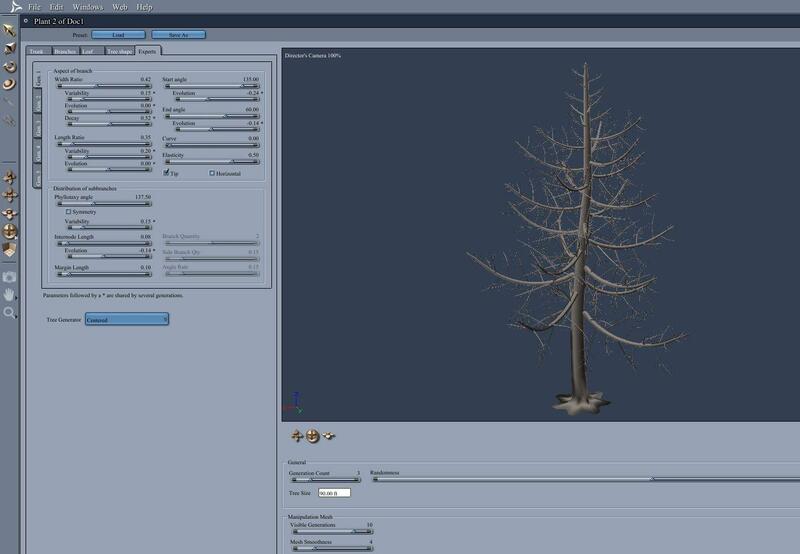 The tree generator tab is found in the lower left of the experts tab. The choices are Centered (default), Hybid, and Ramified. Centered is default. It creates a tree in which the main trunk is a single pole from which the sub-branches emerge as spokes. It is most useful for a tree that is tall and narrow. I will be using this centered option for the red maple. (note that the defult maple that comes with C8.5 native content is not centered, I think). A ramified tree allows for a trunk that splits into multiple trunks leaning out to the sides as they ascend. This is most useful for trees that spread outwards. I plan to use the ramified option when I do the acacia tree. If you use the default Centered generator, then another place to choose the general appearance of the tree is the tree shape tab. 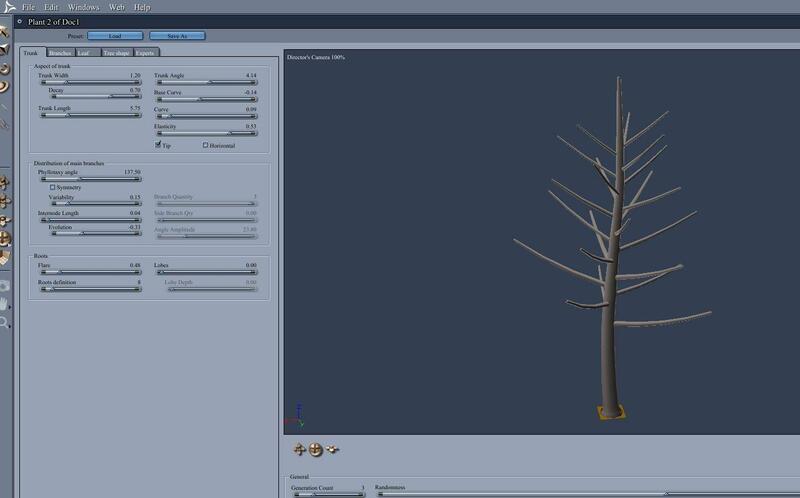 If you choose ramified, then the tree shape menu will be grayed out and cannot be used. 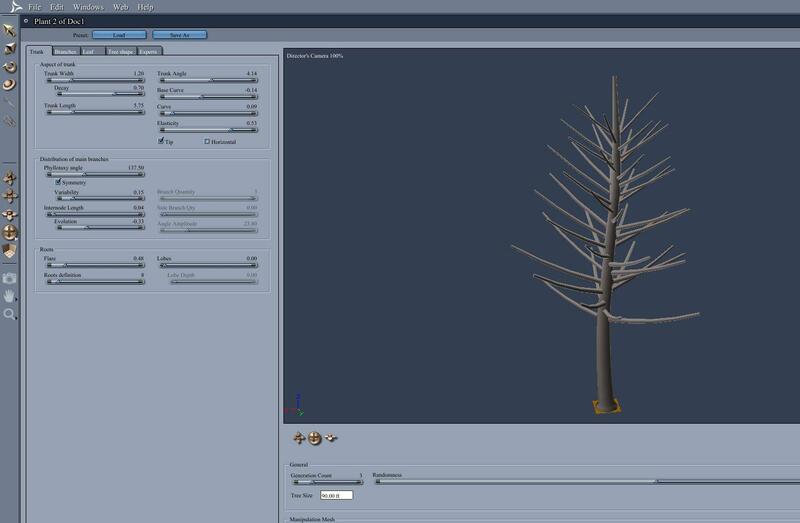 If you choose centered, the tree shape tab has several presets, including spherical, cylindrical, etc. 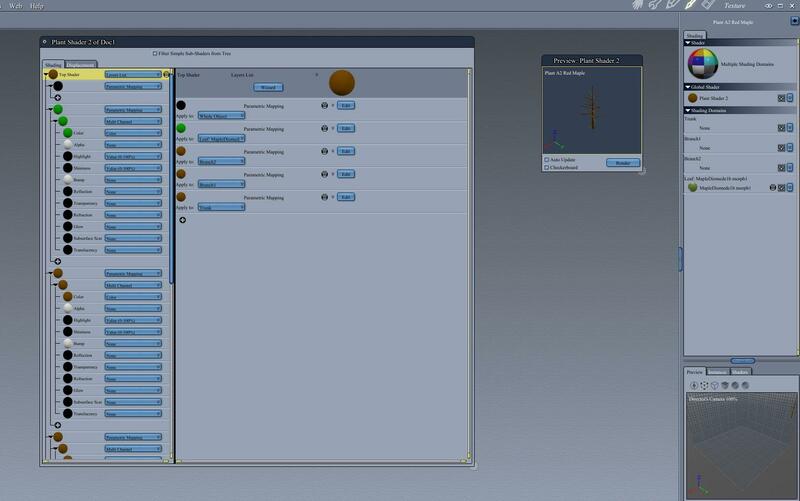 However, you can customize the shape even more by using the custom option. The custom choice presents a line graph to adjust the spread of the tree in relaiton to the coresponding elevation of the tree. If you look under the viewport of the trunk tab, you will see options for generation and tree size. 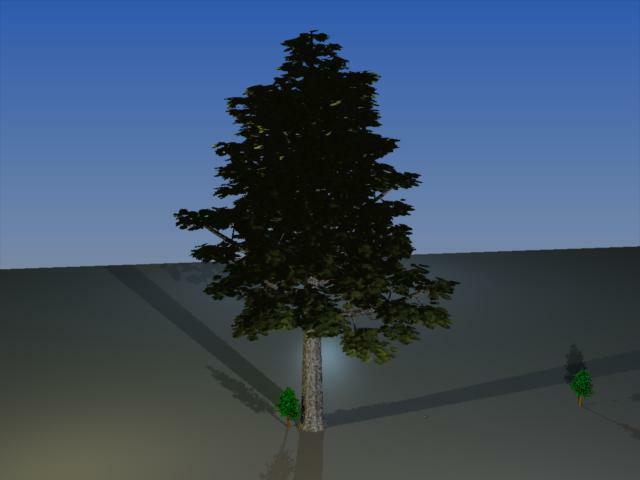 I set generation to 3 and tree size to 90 feet. Red Maples in Pennsylvania are tall. If you look closely, you can see the little default tree next to the resized custom tree. Decay - controls the rate at which the trunk narrows as it rises. A number close to 1 will have a constant trunk. A number close to 0 will have the trunk taper to almost nothing. Length - the length of the trunk controls how far up from the ground the trunk is bare before the first branches appear. Set this low if you want the banches tostart almost immediately. Set this high if yo want a long stem, if you are making a flower for example. You can also create curvature for the trunk. There are two angle controls to affect the direction that the trunk rises. There is also a curve option. Here, I created a more interesting trunk by using the angle function to redirect it, but then the curve function to return the direction upwards. Under the experts tab, there are side tabs for each generation of branches. The first generation emanates from the trunk. The 2nd from the 1st. The 3rd from the 2nd, and so on. 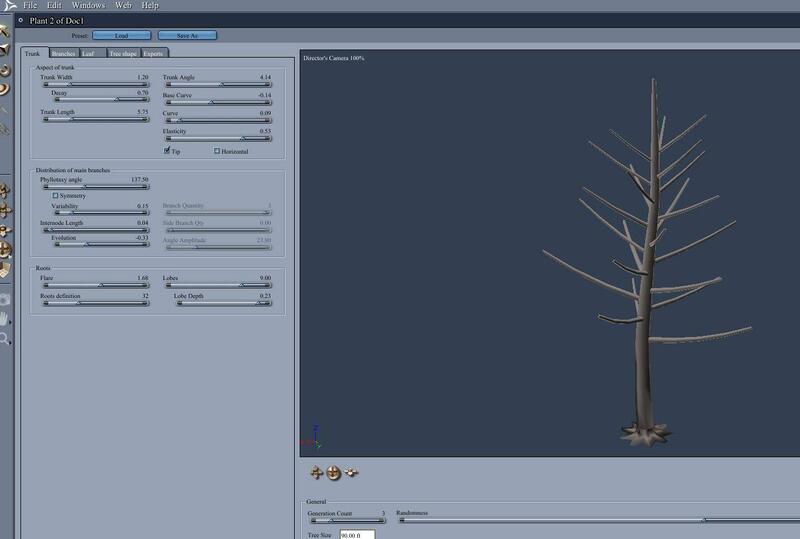 You can use the symmetry options to create a more dense distribution of branches. You can use the intermodal length to create larger gaps between branches. Use branch angles to control if your tree looks like an evergreen pine with raised branches or a willow with drooping branches. 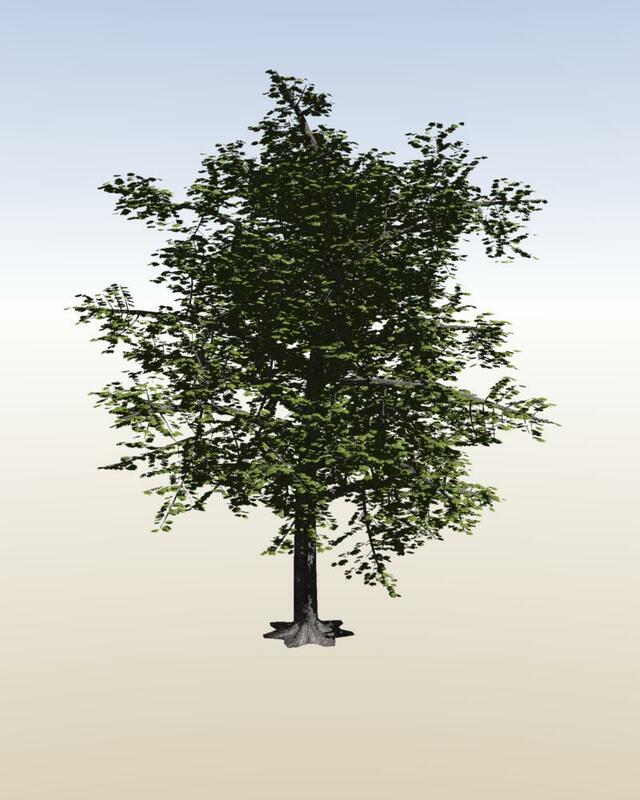 The experts tab allows you to adjust each generation of branches similar to the way that the trunk can be altered. For example, you can control thestart and end angles of a generation of branches. A start angle of 0 degrees has the branches coming out perpendiular. A start angle lower than 90 has branches going out in the same direction as the branch or trunk it issues from. A start angle greater than 90 has the branch bend back toward the source or its parent. Here, a 1st generation start angle of 45 has the branches angling up. Here, a start angle of 135 has the branches angling down. The end angle can also be controlled. The combination of start angle and end angle will curve the branch even if no other curve option is applied. Here, an end angle of 45 is up. Here, an end angle of 145 is down. With the experts tab, you can control EACH generation of branches like the trunk. Width, decay, intermodal length, and curves all work like the trunk. 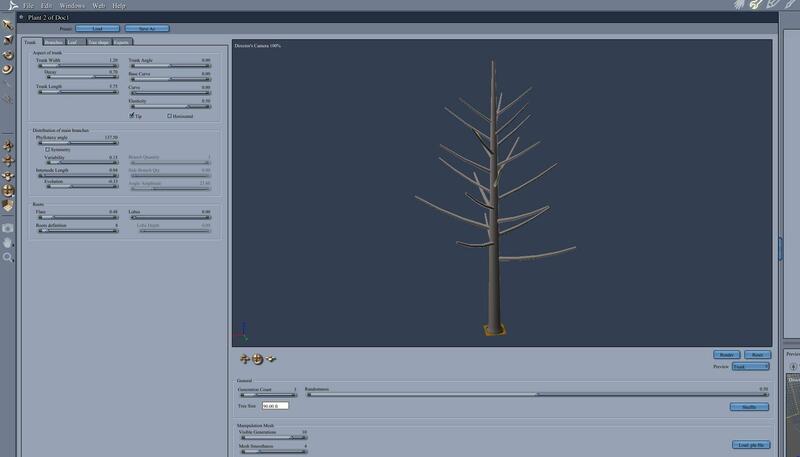 In addition, you can control the ratio of the branch length to the length of its parent (trunk or branch). Roots - Trunk Menu - Hmmmmm, maybe tree base. The trunk menu has the options for the roots. However, it does not give much control to create a system of roots. Might be more accurate to call this the tree base. Use the controls to wden or narrow the base. You can also create a number of simple nodes, called lobes. The key to getting some definition is to use lobe depth. NOTE - in the first or second Carrara challenge, a clever artist used a second upside down plant to create a system of roots. If roots are to be exposed, probbaly a muc better option. Test render of a custom red maple. Curved trunk. 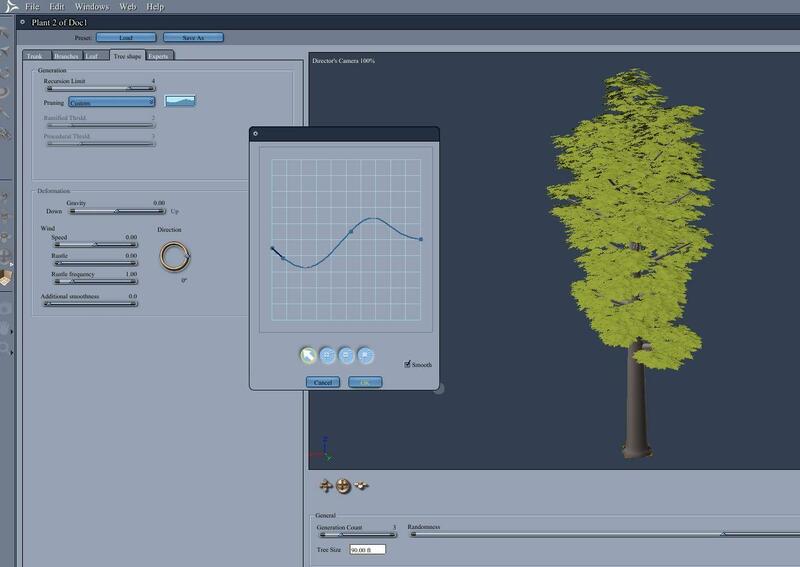 Custom tree shape using the graph editor. 1st generation of branches 57 percent of trunk length. OK, needs some more work. 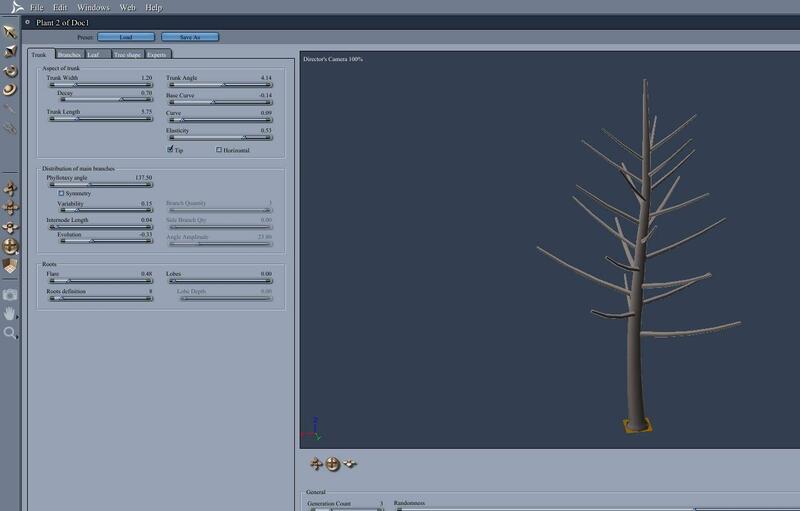 But hopefully this is a good start on creating my own custom trees. 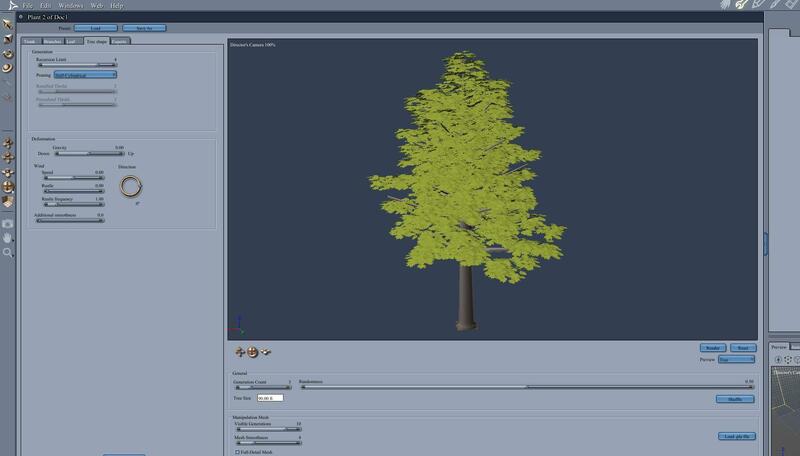 And here is a comparison of using the settings for ramified to get a broader tree more suitale for a savannah. Thanks for taking the time to post such detailed explanations. Looking great! 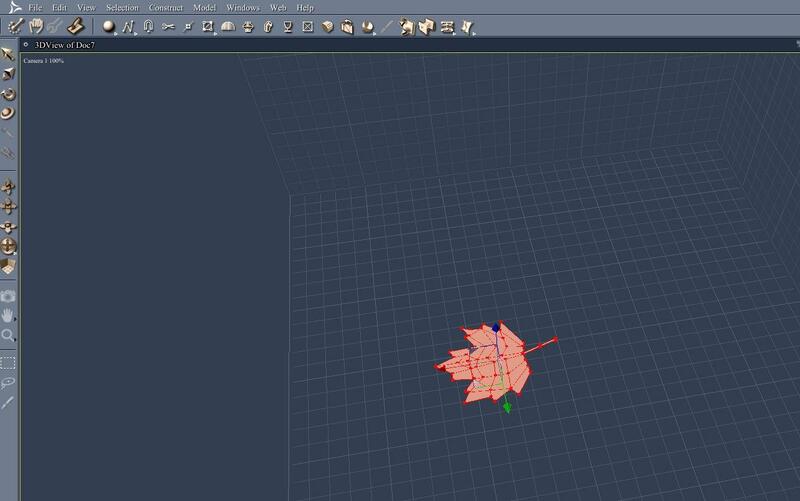 Echo the use of multiple leaf models: maybe have one that's a cluster of leaves, and don't forget you can add berries, blossom/flowers etc. Also try to have more than one leaf texture - the variation in colour helps make it look more natural. And play around with some of the other leaf settings (distribution, size, quantity, orientation etc), they can really make a big difference to the look of your tree. 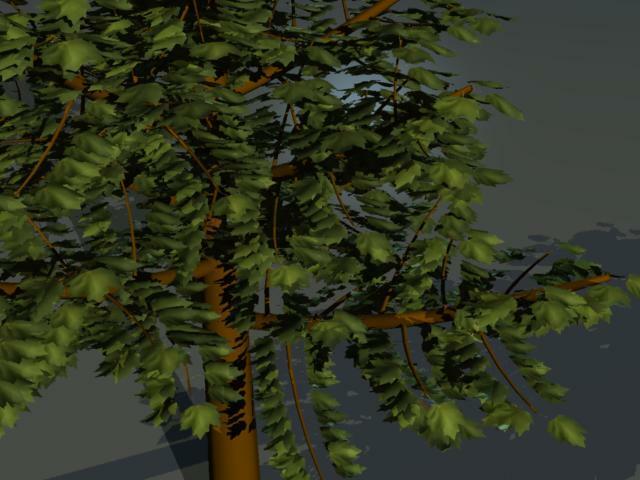 Tim, even this plane-Jane tree had 99,000 polygons when exported to Daz Studio. 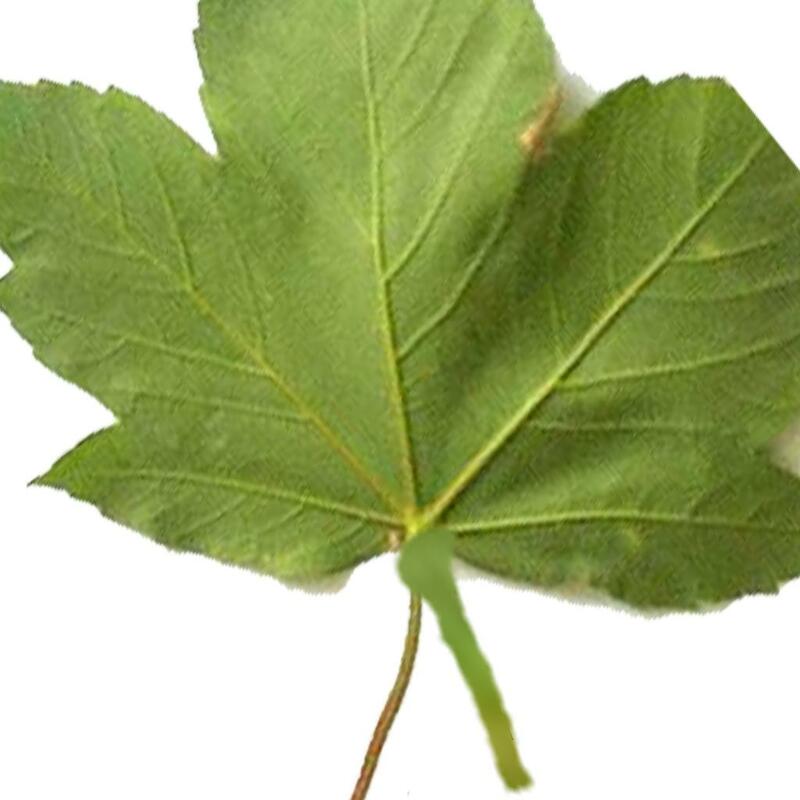 To reduce polygon count, I know I can reduce the polygons in each leaf. Any other suggestions? 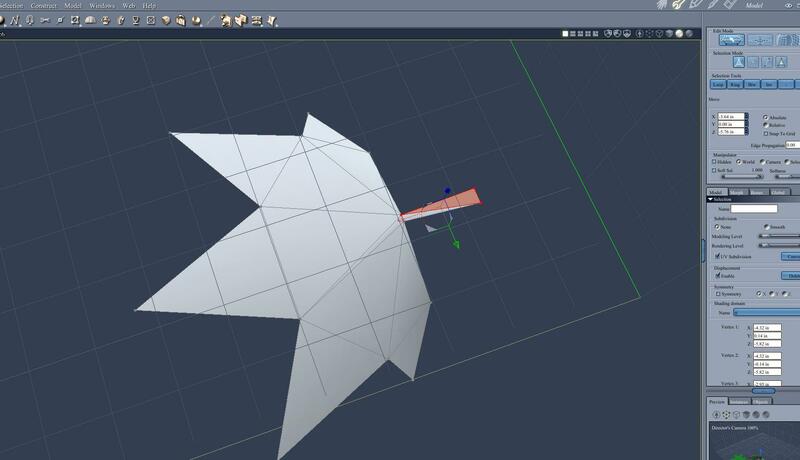 - Reduce Mesh Smoothness in the plant editor. Unfortunately it's a global setting, so while you might want the definition on the trunk and branch1, you'll also get it on the tiny branches, which won't notice and is very wasteful. 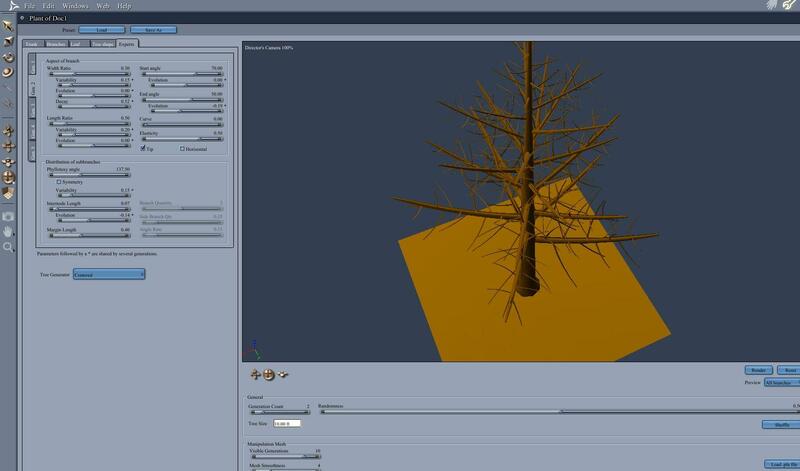 Consider smoothing the big branches later in the vertex editor. BTW, mesh leaves render much better & faster than transmapped squares by orders of magnitude. I wouldn't consider using transmapped squares unless I really had to. 100K is not too outrageous for a bigish tree. It's when you get to 1/2 a million+ you really need to start worrying! Thanks, Tim. All good suggestions. 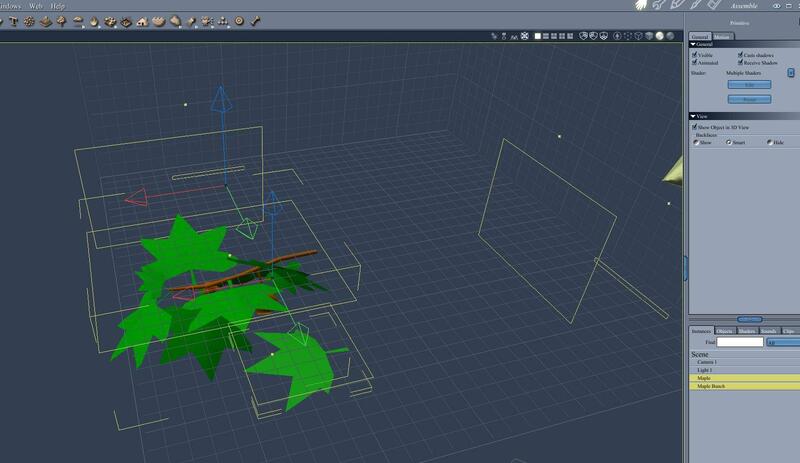 I was thinking the same thing about using ultrascatter to fill in the tree subbranches and leaves. 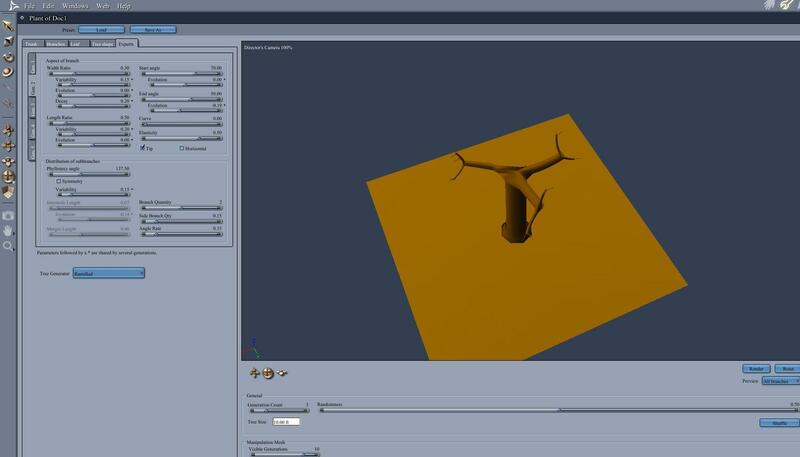 I had actually done something similar with replicators to make my own vertex tree in the very first Carrara challenge. Unfortunately, I am just dipping my toes in Studio and Ultrascatter. Very nice into+ to the tree editor. Some good info on this thread! Great tips, Tim. Noted. Thanks for the encouragement, John and Phil. Still playing with the plant modeler. This experiment was only moderately successful, but posting anyway. I succeeded in learning useful stuff, but not in what I was going for. I think that for what I was going for it would make more sense to use the vertex modeler and the polyline tools and a replicator. 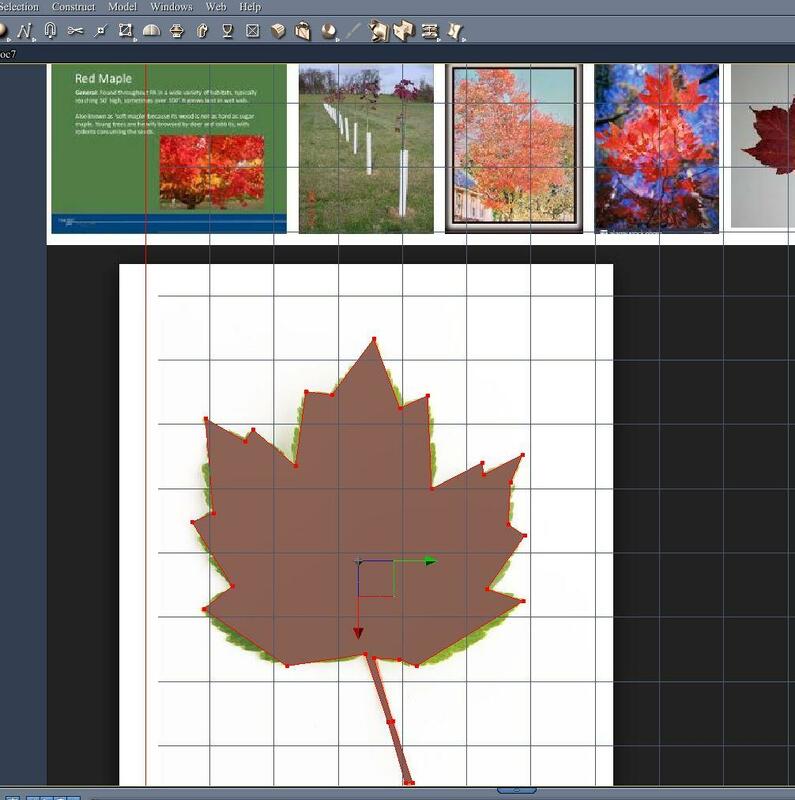 However, some of the lessons from the plant modeler were still useful for other projects, but not this one. I will post my plant modeler experiment first, and the vertex modeler later as time permits. What is the project? I want a vine ripening plant. In this case, it is a pumpkin. I succeeded in some aspects of the plant modeler (matching the pumpkin stem to the branch shader, for example), but not in others (having the vines grow along the ground, for example). 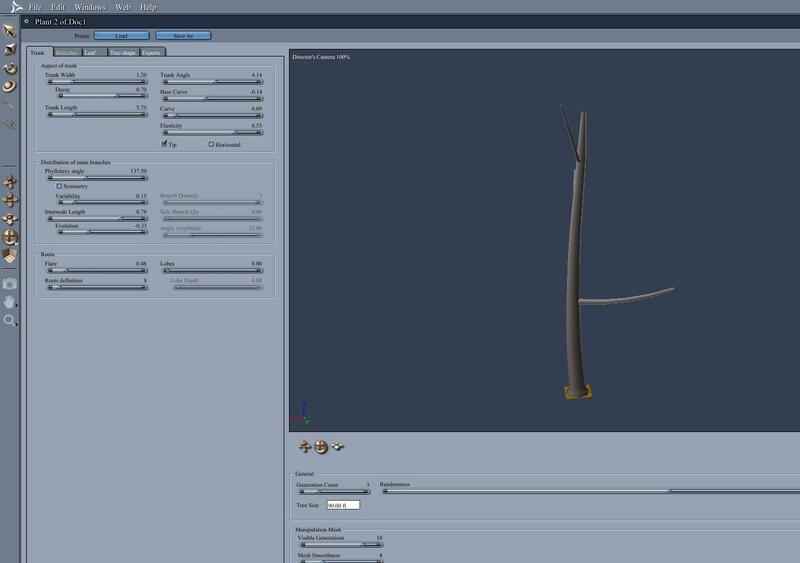 Plant modeler method could work if it grows on vertical vines, if that should come up. Here is the yucky test render for a pumpkin patch for vines along the ground. Booooo. Booooo. Could you not just "grow" it vertically and then rotate it 90 degrees? You would probably need to adjust the root, but it might offer a way forward. - model a pumpkin with a stem so that the stem would attach to a branch. 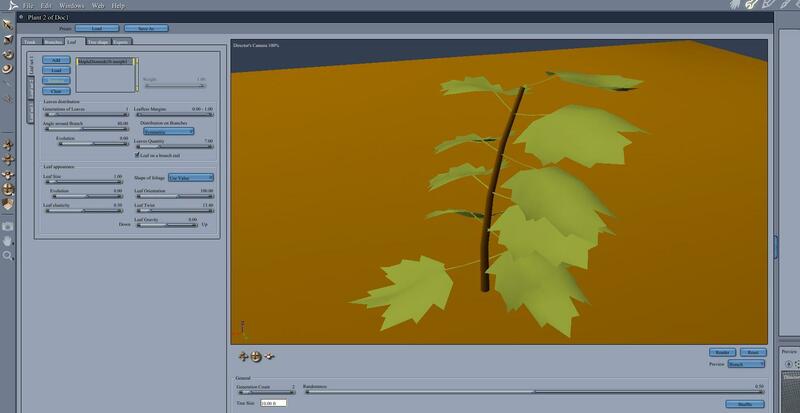 - use the plant modeler to angle the trunk and reduce the number of branches and "leaves"
- in plant modeler, delete default leaf and load pumpkin as a "leaf"
OK, as mentioned above, would have been better to insert a terrain and use the vertex modeler polyline tool to model vines to fit te terrain, and then repliate the pumpkins on the vines. But maybe te essos from this workflow are still useful for other vine plants. PhilW, you posted while I was typing. Yes, your suggestion would also work but I was trying to preserve roots, so wanted the initial bend.